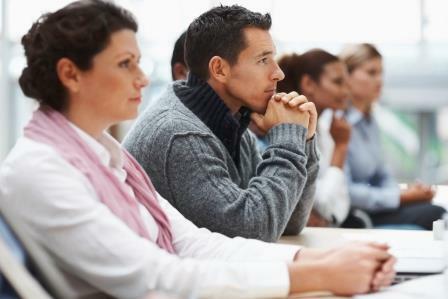 Photo above: Estate Planning Issues Related to Business Transitions – read about this training for business owners below. 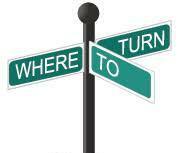 Estate Planning Issues Related to Business Transitions: Are you thinking of retiring or selling your business? Join us on Wednesday, February 20th, from 1-3 pm at Sunrise County Economic Council (7 Ames Way, Machias) for a conversation with Attorney Rebecca Sargent who will be discussing business transition issues such as estate and income taxes, designating a power of attorney and how selling your business may impact your MaineCare eligibility for various elderly long-term care services. Register here. This training is brought to you by the Ownership Transition Initiative which can offer a wide variety of education, training and services, at low or no cost, for the County’s business owners to develop exit plans that sustain their business after retirement and improve the quantity and quality of jobs in the region. For more information, please visit the Ownership Transition Initiative website. Hope Fund Closing for Season: The CCC’s Hope Fund has come to the end of its funding period and will not be accepting new applications until the fund re-opens in the fall. This is the 7th year the fund has operated, helping families with auto repairs and other expenses to regain stability (over 75 families between October and January!). Please help spread the word to providers who regularly work with families on Hope Fund Applications. We will post updates on findings from the Hope Fund evaluation in progress and any changes to the application process on the Hope Fund Page of our website and here in this newsletter. 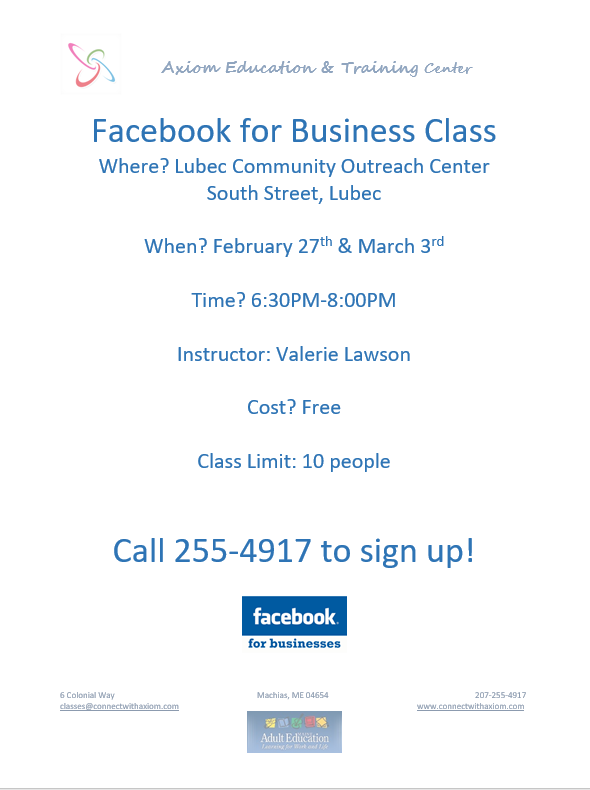 Facebook for Business Class: Axiom Education & Training Center is holding a free class on using Facebook for Business, February 27th and March 3rd from 6:30 — 8 pm at the Lubec Community Outreach Center, South Street in Lubec. Call 255-4917 to sign up. 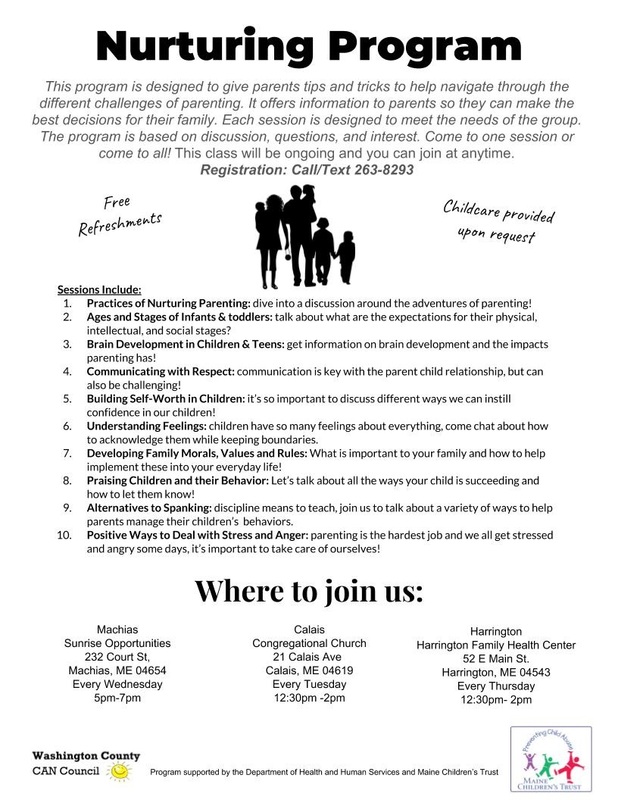 Share this flyer with someone who may be interested in taking this class. Limit is 10 so don’t delay. Digging into Farm Accounting in Caribou: Maine Farmland Trust (MFT) is offering Digging into Farm Accounting, a free two-day farm accounting workshop, in a relaxed and friendly environment where all questions are welcome, sponsored by Bangor Savings Bank. 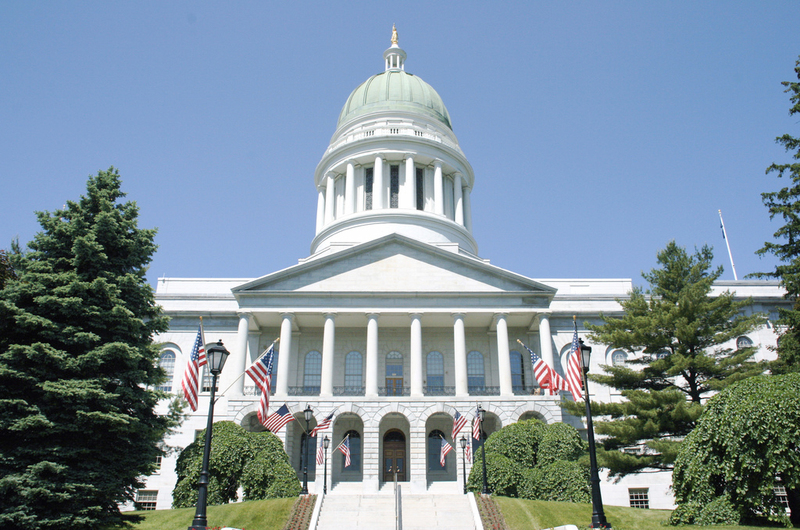 The session will take place in Caribou on Friday, March 15th from 4 — 7:30 pm and Saturday, March 16th from 9 am — 5 pm at the Northern Maine Development Corporation (NMDC) Board Room at 11 West Presque Isle Road. Workshop participants will receive Julia Shanks’, The Farmers Office: Tools, Tips, & Templates to Successfully Manage a Farm Business. Students will also have access to 11 essential farm business templates including QuickBooks charts of accounts for Mac & PC, and a PowerPoint Investor Presentation Deck. Pre-registration is required by Tuesday, March 12th at noon. Register online. Questions about registration can be directed to Rachel K at the MFT office, rkeidan@mainefarmlandtrust.org or 207.338.6575. Lodging options are available for Friday night in Caribou and Presque Isle. Limited funds are available to help defray some overnight costs for Washington County farmers. Advancing 2Gen Strategies in Rural America: Aspen Institute Community Strategies Group and the Rural Development Innovation Group invite you to our ninth lunch panel and discussion in our series: All Together Now: Advancing 2Gen Strategies in Rural America, on Thursday, February 28, 2019, from 12 — 1:30 pm via livestream or in-person in Washington, DC. Our February 28 America’s Rural Opportunity session will focus on the how-to’s of designing and supporting effective 2Gen efforts in rural places. We will feature practitioner stories from two pathbreaking rural 2Gen efforts – one from Appalachian Western Maryland and another from Downeast Maine (Charley Martin-Berry, Executive Director of the Community Caring Collaborative). We’ll talk about how policy can advance (or hinder) 2Gen, share relevant data on the situation of rural families, and detail ideas for what philanthropy and business and economic development leaders can do to help advance 2Gen efforts. Register for this online event here. Winter Sports & Fun at Pottle Tree Farm: You are invited to the 17th Annual Congenital Heart Defect Awareness Day Winter Sports & Fun at the Pottle Tree Farm on Saturday, February 16th from 10 am — 3 pm. Free, fun activities for the whole family, including skating, snowshoeing, sledding, cross-country ski racing, and a fireside potluck (bring food that hold up in cold weather such as finger food, bread, chili or soup, salad or cookies), plus a Dead River Raffle for 50 gallons of fuel oil. In addition to fun, the event provides funds for Stronghearts, a Perry-based foundation. Stronghearts was established in 2002 by Brian and Sue Duffy in memory of their son Seamus who died of a congenital heart defect, Hypoplastic Left Heart Syndrome. Each year, Stronghearts raises money to help families caring for children with congenital heart defects with medical expenses, travel and meals. Stronghearts sends children to Camp Meridian where they were able to be with other children with congenital heart defects. Stronghearts also offers emotional and logistical support to families who are faced with the challenges of raising a child with a congenital heart defect. For more information about Stronghearts and Congenital Heart Defect Awareness Day go to Stronghearts.org. For more information on Winter Sports & Fun, see this flyer. Age-Friendly Healthcare: On March 28th from 12–1:30 pm join the Tri-State Learning Collaborative on Aging for a free webinar discussing how health care systems in northern New England are transforming the way care is provided to include an emphasis on what older people want and need. Register here. Food Pantry Network Meeting: Don’t miss the next meeting of this group at Eastport’s Labor of Love Garapy Food Pantry, March 7th (March 21st snow date) at the new 1-4 pm time for this and future meetings! — Download the agenda here. 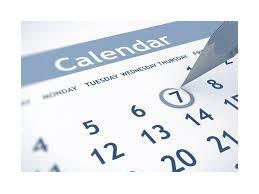 See the full schedule of meetings in the Standing Meeting section of this newsletter. How the donation of a new or used Keurig brewer will help out Family Futures Downeast. Click here to read the full article (from UMaine Aging Research Emerging Area Update, February 2019, Volume 6, Issue 2). You are invited to the 17th Annual Congenital Heart Defect Awareness Day Winter Sports & Fun at the Pottle Tree Farm on Saturday, February 16th from 10 am — 3 pm. 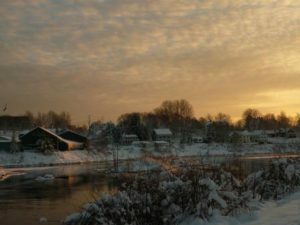 Free, fun activities for the whole family, including skating, snowshoeing, sledding and a fireside potluck, plus Dead River Raffle for 50 gallons of fuel oil. Read this flyer for more details. Are you thinking of retiring or selling your business? Join us from 1-3 pm at Sunrise County Economic Council (7 Ames Way, Machias) for a conversation with Attorney Rebecca Sargent who will be discussing business transition issues such as estate and income taxes, designating a power of attorney and how selling your business may impact your MaineCare eligibility for various elderly long-term care services. Register here. This training is brought to you by the Ownership Transition Initiative which can offer a wide variety of education, training and services, at low or no cost, for the County’s business owners to develop exit plans that sustain their business after retirement and improve the quantity and quality of jobs in the region. For more information, please visit the Ownership Transition Initiative website. Axiom Education & Training Center is holding a free class on using Facebook for business at the Lubec Community Outreach Center, South Street in Lubec from 6:30 — 8 pm. Call 255-4917 to sign up. Share this flyer with someone who may be interested in taking this class. Limit is 10 so don’t delay. Aspen Institute Community Strategies Group and the Rural Development Innovation Group invite you to our ninth lunch panel and discussion in our series: All Together Now: Advancing 2Gen Strategies in Rural America, from 12 — 1:30 pm via livestream or in-person in Washington, DC. Our February 28 America’s Rural Opportunity session will focus on the how-to’s of designing and supporting effective 2Gen efforts in rural places. We will feature practitioner stories from two pathbreaking rural 2Gen efforts – one from Appalachian Western Maryland and another from Downeast Maine (Charley Martin-Berry, Executive Director of the Community Caring Collaborative). We’ll talk about how policy can advance (or hinder) 2Gen, share relevant data on the situation of rural families, and detail ideas for what philanthropy and business and economic development leaders can do to help advance 2Gen efforts. Register for this online event here. The CCC invites you to a brown bag lunch on Transgender Cultural Competence: beyond the basics and the binary, presented by Hannah Ruhlin of Health Equity Alliance, from 11:30 — 1 in the large conference room at SCEC (7 Ames Way, Machias). Learn supportive, respectful approaches for communicating with and advocating for transgender children and adults. Bring your lunch and we’ll provide dessert. RSVP to Christine and share this flyer with colleagues. 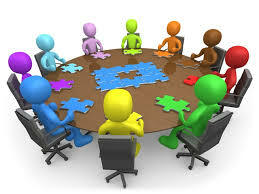 Participants are welcome to stay for the CCC’s Work Group and Poverty Busters meeting immediately following. Maine Farmland Trust (MFT) is offering Digging into Farm Accounting, a free two-day farm accounting workshop, in a relaxed and friendly environment where all questions are welcome, sponsored by Bangor Savings Bank. The session will take place in Caribou on Friday, March 15th from 4 — 7:30 pm and Saturday, March 16th from 9 am — 5 pm at the Northern Maine Development Corporation (NMDC) Board Room at 11 West Presque Isle Road. Workshop participants will receive Julia Shanks’, The Farmers Office: Tools, Tips, & Templates to Successfully Manage a Farm Business. Students will also have access to 11 essential farm business templates including QuickBooks charts of accounts for Mac & PC, and a PowerPoint Investor Presentation Deck. Pre-registration is required by Tuesday, March 12th at noon. Register online. Questions about registration can be directed to Rachel K at the MFT office, rkeidan@mainefarmlandtrust.org or 207.338.6575. Lodging options are available for Friday night in Caribou and Presque Isle. Limited funds are available to help defray some overnight costs for Washington County farmers. March 7, 1-4 pm ( March 21 for a snow date) at Eastport’s Labor of Love Food Pantry, 137 County Road, (route 190), Eastport – download agenda here. June 6, 1-4 pm; Location to be determined. Work Group & Poverty Busters: Join this meeting of direct service providers to share resources and network with other providers in your area. The next meeting is today, February 6th, in the large conference room at SCEC, 7 Ames Way, from 1 — 3:00 pm with another 30 minutes for informal networking and discussion. Read the agenda for this meeting. 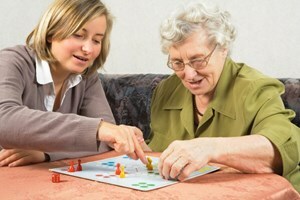 Sunrise Community Connections: Are you a senior who would like to have someone stop by and visit you now and then? You may want to play your favorite board or card games, put a puzzle together, work on a small project or just sit and chat. No cost or other catch. Please call Rob Hood, Director at S.C.C., if you’re interested in more information at 207-255-8858 or email hood@sun-rise.tv. Download a flyer to share with friends. Keurig Needed: Family Futures Downeast is looking for a new or used Keurig – any style, for the UMM Family Room. This is a child-friendly space on campus where parents meet with tutors, the FFD coach and have a place to study that is equipped with internet, a printer, school supplies, and of course, toys and games to keep kids busy while parents are getting work done. We keep the Family Room stocked with healthy snacks for parents & kids, and have coffee, water and juice. Our old Keriug is broken – and how is a college student supposed to study without coffee!?!!? LOL! Anyone able to donate can contact Marsha Sloan or Jasmine Bassett at 255-0983, or jbassett@sunrisecounty.org or msloan@sunrisecounty.org. Click here for the full report (from UMaine Aging Research Emerging Area Update, February 2019, Volume 6, Issue 2).